Cascadia Wind Ensemble is a flourishing concert band in the Lower Mainland of British Columbia. The Conductor and Music Director is Shannon Goldsmith who has many years experience conducting award winning bands and orchestras. 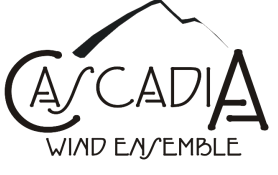 The Cascadia Wind Ensemble welcomes adult and youth musicians who own their own instruments and want to play in a challenging and rewarding musical environment. See the vision. The Cascadia Wind Ensemble rehearses primarily in Abbotsford on Thursday evenings from 7:30 to 9:30 pm. Some rehearsals are in Chilliwack depending on rehearsal space availability. See the "Rehearsal Schedule" page for details. Cascadia has musicians from teenagers to 80+ years old from Langley to Agassiz in the Fraser Valley and from and Washington State. We are a non-profit organization in the Province of British Columbia and a registered charitable organization with the Government of Canada. ​We receive some funding from the Gaming Policy and Enforcement Branch of the Province of British Columbia and we gratefully acknowledge their support. If you are interested in playing in this exciting band get in touch with one of the people on the contacts page. Check this page often for updates on rehearsal location and other news. Note: if you are using Internet Explorer these pages may not load correctly if you are in "compatibility view".